The nationwide search is on to find the next woman to become a WWE star. Bunim-Murray (The producers of Total Divas and Keeping Up With The Kardashians) along with the WWE are holding an open an online open call for women that are athletic, entertaining and charismatic to possibly be added to the roster of WWE superstars. The production company seems to working on a new TV show and is looking for the cast of an upcoming WWE show. The show is focusing on ONLY females and is only accepting submissions for women that want to join the cast. If you think you have what it takes to be the next WWE Diva… read on. WWE is short for the World Wrestling Entertainment franchise which started out in televised wrestling and has branched out into other forms of media and entertainment. Their live shows draw massive crowds and they also have the WWE Network which began in 2014. 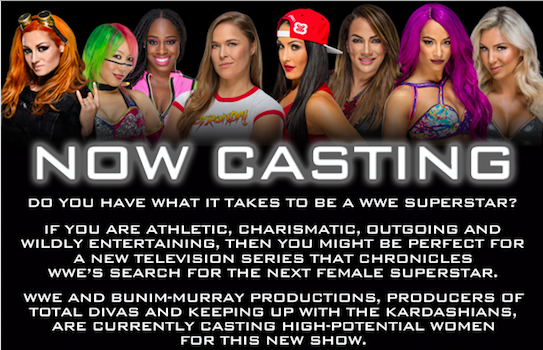 If you are athletic, charismatic, outgoing, and wildly entertaining, then you might be perfect for a new television series that chronicles WWE’s Search for the Next Female Superstar. No Previous Wrestling Experience Needed! To apply, please see the following page. Please note that in order to be considered, those applying must be 21 by March 2019.